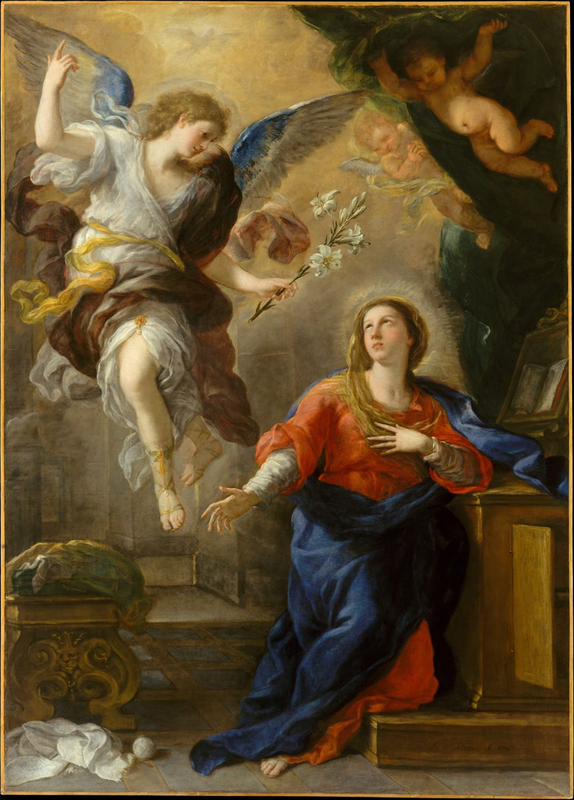 The Annunciation, Luca Giordano, 1672. Calvin begins with some broad reflections. First, he notes, there is a stark contrast between the annunciation of John’s birth and Jesus’. John’s is announced publicly at the temple for everyone to see, while Jesus’ occurs privately and remains a secret. Second, Mary’s acceptance of this announcement, combined with her protection of its secretive nature, makes her an exemplar of faith. Still uncertain about the meaning of this proclamation, she trusts God with a quiet faith. v. 32a: Calvin then turns to the salvation that is promised in Christ. This begins with a comment on what it means to be children of God and culminates in the final two verses of this section with an exploration of the relationship between the Church and Israel. The angel’s proclamation that Jesus will be called “Son of the Most High” prompts Calvin to reflect on the Trinitarian implications. It is true, broadly speaking, that the Israelites were sons of God and their kings especially were known by the name sons of God. It is also true, broadly speaking, that God was known in all ages as Father. Here, we have specific porto-trinitarian language that acknowledges that Jesus’ sonship is unique. He is the Father’s one true son. Our sonship, Calvin reminds us, is by our adoption and membership in Christ’s body.. It is by faith, not by nature. vv. 32b-33: Christ’s enthronement on David’s throne means, of course, that he will be the messiah who rules over Israel. Calvin explains that the Jews understood the renewal of the church would come from the messiah. Calvin here uses the term church to refer to the people of Israel. This is suggestive of his ecclesiology: that Israel is the church prior to the incarnation. The following verse, Calvin uses Luke’s reference to “the house of Jacob” in order to acknowledge, first, that Luke is speaking of the Jews, but that, second, this does not contradict what God does when he expands the house of Jacob to include gentiles by adoption. “True Israel” are those who Christ gathers to himself by faith. The relationship between Israel and the Church, then, appears to be this: historic Israel was the “true church” to the time of Christ; now, the church is “true Israel”, a spiritual Israel, that will include some of historic Israel (a remnant). Mary’s question, “how?” is not meant to be interpreted as doubt, according to Calvin. For Mary, the natural impediments that her virginity cause prompt wonder, not doubt. Ultimately, her obedience is a reflection of the grace of God at work in her faith. The angel points Mary to the work of the Holy Spirit as an answer to the how. Calvin especially emphasizes the Spirit’s work as the means by which God works in his creation at all points. Calvin writes, “The Spirit is, as it were, the essential virtue of God, whose effect comes out and exerts itself both in the general government of the world as in miracles” (v. 35). That Jesus is to be conceived by the Holy Spirit, implies the two natures Christology. Christ’s sonship precedes the incarnation; yet, with the incarnation, his human nature is properly taken up into the second person of the trinity so that we must say both his divine and human natures are included in the title Son. The virgin birth and his sinlessness are necessary not only to protect the two natures doctrine but also to adequately account for Christ’s role as mediator in the doctrine of salvation. He must be sinless to overcome Satan. To be sinless, he must be born of woman and the Holy Spirit. Finally, Mary’s acceptance of her role is taken up by Calvin. Mary’s “let it be unto me” is her faith in God transforming into action. She not only accepts God’s will, but she desires it for herself, and she devotes herself to its accomplishment. Faith, Calvin says, makes us God’s obedient servants while faithlessness makes us disobedient rebels to God’s will. Elizabeth’s exaltation to Mary, “Blessed are you”, is not adoration of Mary herself. It is an acknowledgement, prompted by the Holy Spirit, that Mary is blessed because of her faith. For Calvin, Mary’s faith is a sure sign that “true felicity” and happiness (eudaimonia?!) is found in faith, which “draws us up from the depths … into the community of true happiness” (v. 45). Speaking now in terms of salvation, Calvin claims that faith is the difference between salvation and damnation: “God offers His benefits to all without distinction, but faith opens our arms to draw them to our bosom: lack of faith lets them fall, before they reach us” (v. 45). Thus, Christ’s saving activities are “for all” (universal in scope) and yet not all receive them. The Magnificat is Mary’s testimony regarding what God is doing. Her boasting is not regarding her own estate but the salvation that God is accomplishing through her. In that sense, Mary’s song is primarily an act of gratitude and thanksgiving. Indeed, Mary emphasizes her unworthiness for the task in order to highlight God’s activity alone as the source of her blessedness. Calvin claims: “Mary, in emptying herself, elevates God alone” (v. 48). Indeed, Mary places her blessedness within the larger narrative of Israel’s covenant relationship with God. The God who is holy and extends his mercy from generation to generation is the God who saves. But Calvin focuses specifically on the phrase “His mercy is for those who fear him” (v. 50), arguing that the covenant with Abraham does not effect salvation for all of Abraham’s descendants. Kinship by flesh alone cannot save; one must become children of God by fearing God. For some of Abraham’s descendants, their hard hearts prevent them from believing and therefore being saved. In the second half of the Magnificat, Calvin focuses on the prophet-like emphasis that Mary puts on God’s humbling of the proud and elevation of the humble. These are the great reversals that shape much of Luke’s gospel presentation of the Kingdom. For Calvin, all of these things speak of divine providence. The manner in which God governs the world is fair and considerate of all. Should one person fall from great heights and another be lifted up from desolation, these things do not happen merely for divine sport. That kings come and go remind us that it is God who ultimately guides the world. Christians are reminded not to put too much stock in their own prosperity. When we remember that we owe everything to God, we live simply and graciously.